Obama Picks Michigan State To Win Men's Basketball Title : The Two-Way "Tom Izzo is a great tournament coach," the nation's "first basketball fan" tells ESPN. It's the sixth time the president has shared his picks. So far, he's been right once. The nation's "first basketball fan" has Michigan State winning it all in this year's NCAA Division I men's basketball championship. President Obama filled out his brackets for ESPN again this year. The sports network aired the president's pre-recorded appearance earlier today. "Tom Izzo is a great tournament coach," Obama said. "I've got Michigan State going all the way. ... He knows how to motivate folks and he knows how to coach. My pick: Michigan State. Bring it home for me. It's been a while since I've won my pool." 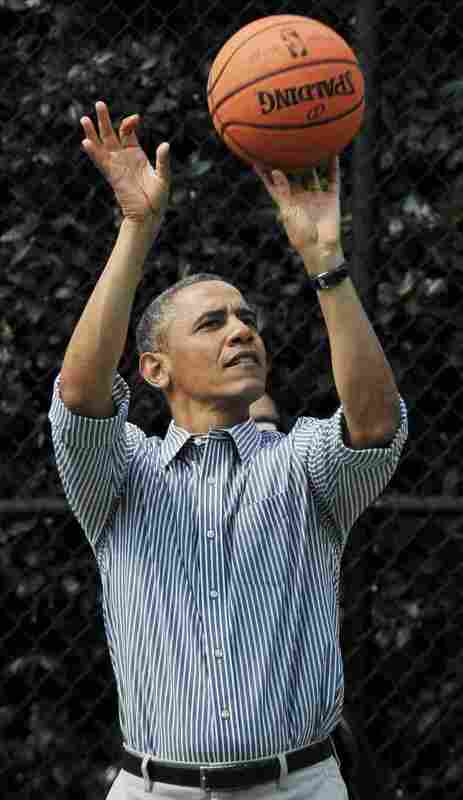 The president is a big fan of the game and still likes to shoot hoops. But has he picked the winner? It's the sixth time ESPN has gotten the president to share his choices. He's correctly picked the winner once. The network recaps his track record as a prognosticator: "Obama has picked three different teams in the 'Barack-etology' era to win the men's title — Indiana (over Louisville in 2013), Kansas (over Ohio State in 2011 and Kentucky in 2010) and North Carolina (over Kentucky in 2012 and Louisville in 2009). His correctly picked national champion was the Tar Heels in '09." The games began Tuesday night with the University at Albany's win over Mount St. Mary's and North Carolina State's defeat of Xavier. Tonight, Iowa plays Tennessee and Cal Poly plays Texas Southern. The NCAA has a schedule here. The White House blog says it will post the president's brackets for the women's tournament on Friday. ESPN says it will be posting the president's other set of brackets that day as well. The women's games begin on Saturday. Filling out brackets, by the way, is a bipartisan passion. Sen. John McCain of Arizona, Obama's Republican opponent in 2008, has again posted his picks. Perhaps not surprisingly, he ends up with the University of Arizona as champion. Related post: Is There A Method To Your March Madness?